What Are The Benefits of Tennis For Kids? Improves grades, concentration, focus, independence, and ability to handle stress. Boosts tactical thinking that generates nerve connections to promote lifelong brain development. Develops hand-eye coordination, speed, balance, strength, fine motor control, and flexibility. Burns more calories than aerobics, rollerblading, or cycling to foster healthy weight management. Provides a fun, social activity that people tend to stick with throughout the years. Helps kids learn to win or lose gracefully, manage mistakes, develop perseverance, and recover from stress. Over the long-term, renowned epidemiologist Ralph Paffenbarger found that people who played singles tennis at moderate intensity for just two to three hours per week, cut the risk of death from any cause in half. Who wouldn’t want to give their children the gift of longevity if they could? Most experts agree that four is the earliest age you’d want to begin introducing tennis. The key to getting young kids interested in tennis is to keep it playful and fun, rather than competitive. Specialization can take as long as a decade to achieve, so there is much merit in getting kids onto the court with continuous movement and instruction to learn as they go through gameplay, rather than standing in line and doing drills. “You work on coordination games, movement games, and teaching them building blocks of playing the sport,” explains George Garland, director of Go! Tennis in Queens. For kids ages 4-7, 30 minutes of tennis instruction is plenty. Kids ages 8-12 may increase to 45 minutes. Look for red felt or foam balls, which weigh less and have a slower bounce than official regulation tennis balls. These balls may not last as long for the money, but they give children plenty of reaction time and are softer for safety sake. Join us at Hampton Racquet this summer on Tuesdays, Wednesdays, and Thursdays from July 2nd – August 30th from 3:45 – 6 p.m. 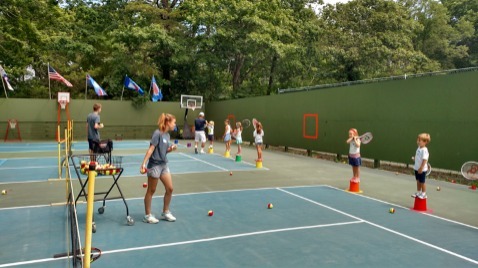 The brand-new “Creative Arts & Tennis Afternoon Camp” introduces children ages 4-12 to the love of learning tennis. We provide masterful instruction from John Graham, racquets, age-appropriate groups, healthy snacks, drinks, and art materials with guided instruction. Inspired by the East End, children are exposed to a variety of creative themes, from local flora and fauna, to architecture and history, explored through a variety of mediums. This unique opportunity engages children in sports, constructive arts, science, nature exploration, games, and books for $99/day, with discounts available for 10+ classes. For more information or to register, email rebecca@shinenyc.net.